Music at Annisquam Village Church: Cem Oslu to perform at the Annisquam Village Church! Cem Oslu to perform at the Annisquam Village Church! 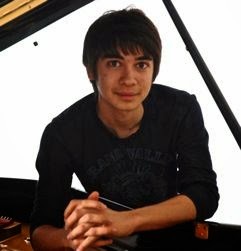 Hard on the heels of a brilliant stint as Music Director of the Annisquam Village Players’ production of “Peter Pan,” 21-year-old Turkish pianist Cem Oslu turns his talents to a mostly classical concert at the Annisquam Village Church, Sunday, August 17. Pushing the ivories in another direction is nothing new for this young prodigy. Born in 1992 in Adana, Turkey, Oslu started his music education with piano lessons at age 12. In only a year, he had won a full scholarship to Bilkent University’s Faculty of Music and Performing Arts where, for five years, he had the opportunity to study with Sanem Berkalp, Hande Dalkilic, Karl-Andreas Kolly, Oxana Yablonskaya, Edna Golandsky and Olga Kern. In 2009, Oslu was awarded Third Prize in the Kamuran Gundemir Piano Competition, and later that year performed the Grieg Piano Concerto in A Minor with the Bilkent Sypmhonic Orchestra (the Turkish “BSO,” in Ankara), conducted by Isin Metin. He was also invited to perform in the 10th Antalya International Piano Competition and at the Musica Mundi International Chamber Music Festival in Belgium. In 2010, he performed Rachmaninoff’s Piano Concerto No.1 with the Bursa Symphony Orchestra, conducted by Ahmet Taviloglu. Later that year he was accepted to Vienna Conservatory where he studied for two years. At Berklee College of Music, Oslu’s concentration has been Film Scoring and Electronic Production & Design. In 2013 he was awarded First Prize in the MTNA (Music Teacher’s National Association) Compositions Competition on both state and regional levels, and Second Prize at the national level. The concert will include piano music of Bach, Chopin, Schumann, and Scriabin. Oslu promises to play a bit of Turkish music on the harpsichord (with its buff stop imitating the sound of the oud! ), and a composition of his own, as well. The historic Annisquam Village Church is at 820 Washington Street in Gloucester (corner of Washington and Leonard Streets). General admission is at the door only: $15. / Students $10. One performance: Sunday, August 17.